What a finish! I’ll have another and I’m not just talking about the horse… This year’s Kentucky Derby and Preakness have turned me into a horse-racing fan. 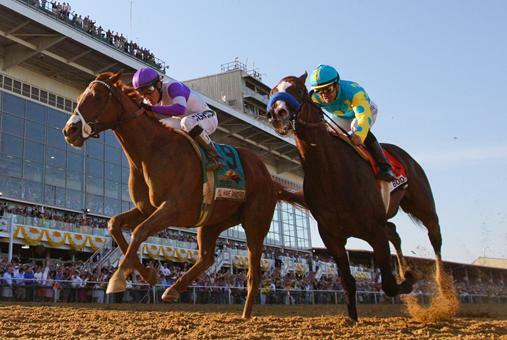 Can’t wait for the Belmont and the chance to see a Triple Crown. I felt like I was watching a replay of the Derby during the Preakness – Bodemeister off to a big lead, then I’ll Have Another comes out of nowhere and edges out the win. The Preakness was of course much closer than the Derby (he literally won a by nose) but both times a late surge secured the wins. Guess you have to give credit to the jockey Mario Gutierrez, who seems extremely humble, and that 3-year old Throughbred. I don’t know a lot about horse racing but I know that the Belmont is the longest of the three races. It will be interesting to see how that affects I’ll Have Another’s M.O. of starting in the middle and coming on strong late to win. There have only been 11 Triple Crown winners in history, and none since 1978. So the Belmont is going to be an exciting day that I am already looking forward to. Check out the trainer’s reaction during I’ll Have Another’s Preakness run. Priceless and just another example of why sports is the best. Can’t even imagine owning/training or having anything to do with a horse beyond placing a bet on it and actually having so much invested in these races. Then to have your horse win… there can’t be a better feeling out there, can there?